See what I mean? Ug! I wanted a cheap, quick solution, so I made a curtain liner out of a twin-sized Target bed sheets. I think they were $10 each. Last time I bought fabric liner from Joann’s, I think it was $5 a yard on sale. These sheets are thin, so if you want a heavier liner, I’d go with a thicker fabric. The twin sheet width was wide enough to cover the width of the curtains, but about a foot too short (we have 10-foot ceilings in this room). Since the window doesn’t go all the way to the floor, you can’t tell that the liner doesn’t extend all the way to the floor. 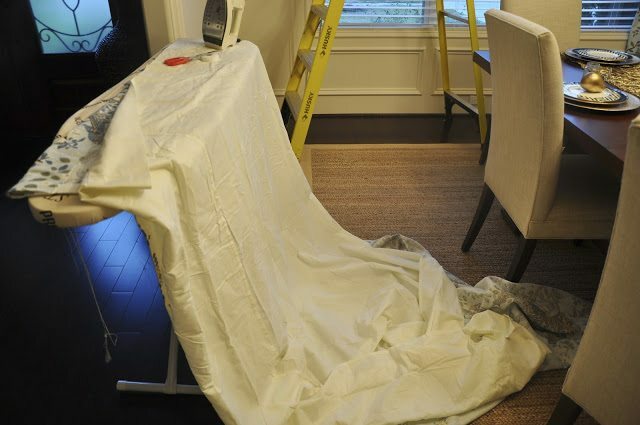 I lay the sheet on top of the drapes and used no-sew tape to iron the pieces together. I started along the top, then did each side, leaving the bottom alone. I also “no sewed” the hem to make the drapes the proper length. Much better! Update: See how we painted the walls. I think the final result came out really nicely! Using sheets is always an economical idea! The panels look pretty. I love the print! What a clever way to add some weight to drapes! Perfect solution!! They look beautiful. I love the fabric. Can you please share the name of it, appears to be something by Robert Allen. The curtains are beautiful. I couldn't believe when I saw this! 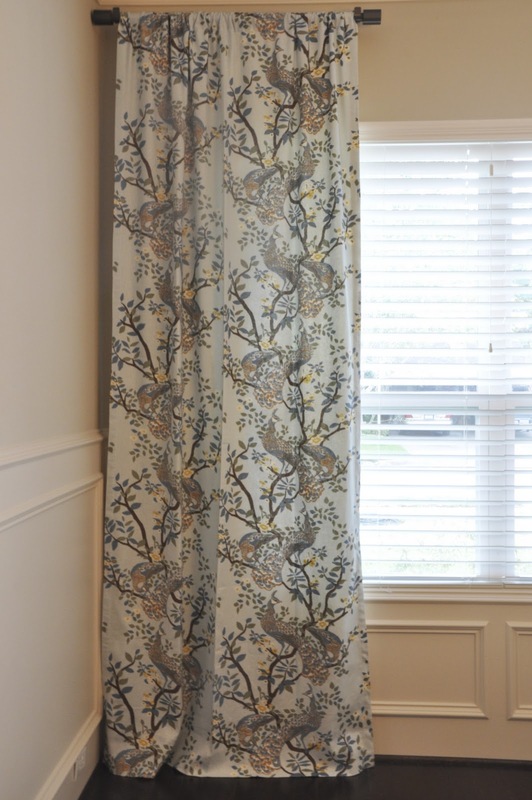 I just ordered fabric to make my curtains (Braemore Fioretto-graphite) and I had already decided I was going to line them exactly the same way-with twin sheets! Have to say, I'm so glad you did your first, now I KNOW it will work! Your dining room is looking so nice. The fabric is beautiful. I love how your dining room is coming together. I can't sew a lick, so the no sew tape definitely comes in handy. Love it! They look beautiful, great fabric. Genius! The curtains look great! That's a great idea – thank you, thank you, thank you! Super easy fix! 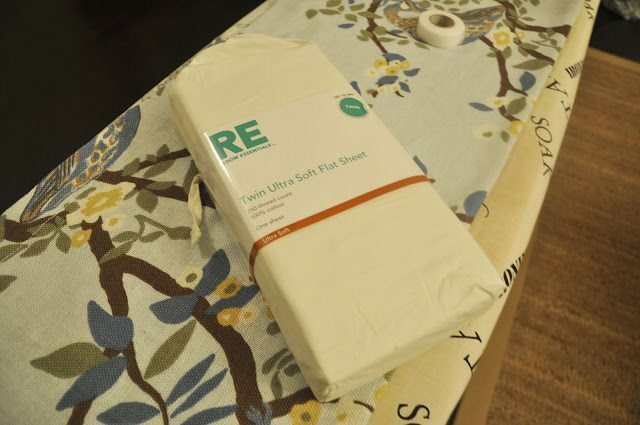 I love sheets…so economical when in need of just a basic fabric. You are the smartest little one! I love this idea and use sheets to line the drapes I've made too but I've always sewn them in. This is easier! 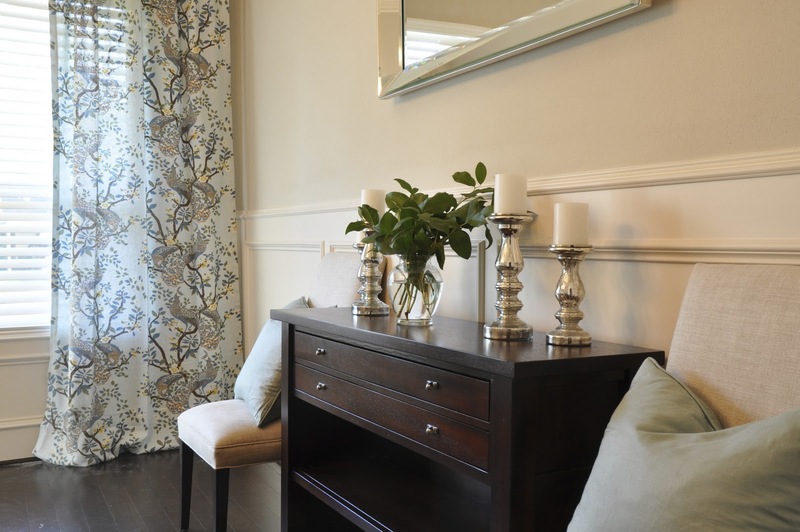 Your fabric on your drapes is gorgeous! You have inspired me! I'm so doing this for our master, instead of paying big bucks for custom. That way if I want to change out in a few years I won't feel so guilty. Your room is realy coming along. That fabric is gorgeous Megan! You are a smart one…the sheet worked perfectly. You are super crafty! What a cheap, easy fix. Megan, they look great! Such a smart idea. I have a client making her drapes this week with new sew tape. I love that stuff. What a smart cookie you are. Not that $10 isn't a phenomenal price, but Ikea has them for around $2. I bought 4 sets just to "have" for any future projects I might do. Buying sheets is the best way to go for lining drapes, way cheaper and easier than buying fabric for sure. They look beautiful in your dining room. You are so clever, Megan! What a smart idea. Your drapes look beautiful. I adore the fabric. I congenital some walls about my table top with avoid tape. You could aswell use painters tape, but get the added adhesive kind. You wish there to be a absolutely bound allowance here. The curtains look fabulous, love the print. 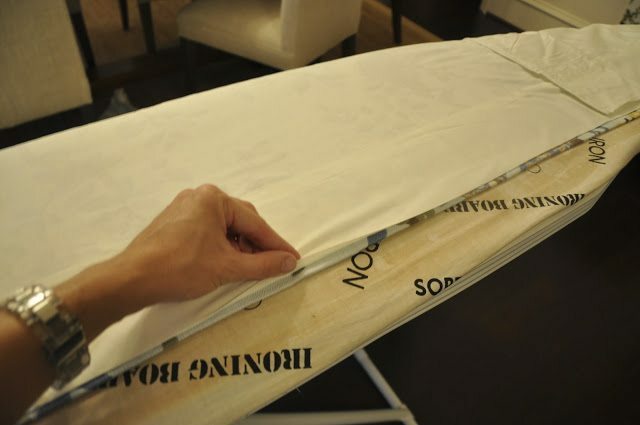 Love your idea of using inexpensive bed sheets for liners. So clever! By the way, I am currently hosting a giveaway. Come by and enter for a chance to win a set of Vintage Alphabet Cards if you like! Wow, it looks so good! Great job!! I love your fabric choice too, the colors are beautiful and the birds are really fun. Brilliant idea – I'm helping a friend with drapes for her dining room (trying to a diy chevron curtain) and I am definitely doing it this way!!! Thanks for sharing. I am new to Houston and have been looking for a seamstress. Please tell us which seamstress you used to have the curtains made.